K2 HID Conversion Kits give off a daylight-like white beam illuminating the road ahead resulting in more confident driving in all weather conditions. High efficiency lamp drivers for solar applications. K2's Ultra High Efficiency Lighting Conversion System allows the new breed of head lamp system to be driven directly from DC sources with the advantage of fast start and instant restrike. Recent innovations in HID head lamp system have delivered high light outputs, quality daylight colour with substantial power savings over conventional lighting technology. K2 has taken this stage on with a single stage switch-mode DC input lamp driver optimised for ultra-high efficiency, longer life span, reducing further installation power consumption, weight, size and cost. 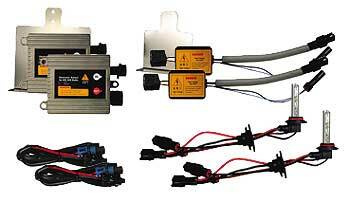 K2's HID conversion kit can be retrofitted for almost any vehicle that uses a 9000 series halogen bulb -ie. 9004 / 9005 / 9006 (HB4) / 9007 and an H-series - ie. H1 / H4 (9003) / H7 as its low beams. All of our kits are beam pattern corrected for direct bolt-on installation with NO MODIFICATIONS required. That means both Halogens and HIDs can be interchangeable and so all you have to do is only mount the ballasts and plug the bulbs in. Our goal is to deliver the best in lighting technology to high performance automotive enthusiasts. By offering direct plug-in HID components tuned by K2, irreversible headlamp housing modifications are no longer needed. With precision engineering and reliability, K2 HID kits are a definite winner. Get the latest and brightest technology available anywhere - for your vehicle. Be the first in your area to benefit from HID Lights.